NEWS REPORT: Not only the 2013 VELUX EHF Champions League winners learnt their fate in the Men's EHF Cup Group Phase on Thursday after the last club draw in 2014. HSV Hamburg know all three stops on the way to the Men's EHF Cup quarter-final as one of the heaviest favourites of this season and the 2013 VELUX EHF Champions League winners have been drawn to Group A together with Norway's Haslum Handballklubb, the Slovenian club Gorenje Velenje and Pfadi Winterthur from Switzerland. 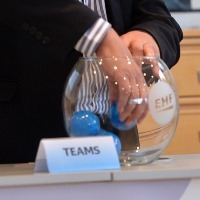 The Thursday's Group Phase draw at the EHF Office in Vienna carried out by Michael Wiederer, EHF Secretary General, determined all four groups. In Group B the Romanian champions HCM Constanta, who made it to the EHF Cup Finals in Berlin last season, will face Fraikin BM Granollers from Spain, Russia's St. Petersburg and the Danish side Team Tvis Holstebro, who ranked third at the first edition of the EHF Cup Finals in 2013 in Nantes. Futebol Clube do Porto, who eliminated another Champions League regulars from Ademar Leon in the last qualification round will play in Group C alongside Serbia's HC Vojvodina, the Danish club Skjern Handbold and Füchse Berlin, who hosted the last EHF Cup Finals finishing third. The German newcomers in the European club handball MT Melsungen will take on Hungary's Balatonfüredi KSE, Eskilstuna Guif from Sweden and RK Nexe from Croatia. The defending champions of the EHF Cup Pick Szeged play the VELUX EHF Champions League this season and they already clinched a knockout berth. Just two weeks after the gold medal match of the IHF World Championsip in Qatar the EHF Cup Group Phase action will start with the Round 1 matches. The group phase will be played in a round-robin system with six rounds. According to the competition’s regulations and as in the previous seasons, if one of the group phase participants will be awarded with the rights to host the EHF Cup Finals, their team can qualify directly for the final tournament from the group phase if they finish in first place in their group or as one of the three best-ranked second placed teams. In this case only three quarter-final matches will be played and the worst second ranked team will be eliminated. Only results from matches against group winners and third ranked teams will be counted in the ranking of teams from second positions. If hosts finish third or fourth in their group, there will be also four quarter-finals. The organisers will not take part at the final tournament, but still they will host the event.